On the other hand, at the top of my own list of essential apps is Focalware, which gives me sun and moon rise/set time, altitude, and azimuth for any location on Earth, regardless of connectivity. For example, until recently Death Valley had no cell coverage whatsoever; even now most of Death Valley is a cell dead zone, and wifi is limited to the (extremely unphotogenic) hotels in Furnace Creek Ranch and Stovepipe Wells. 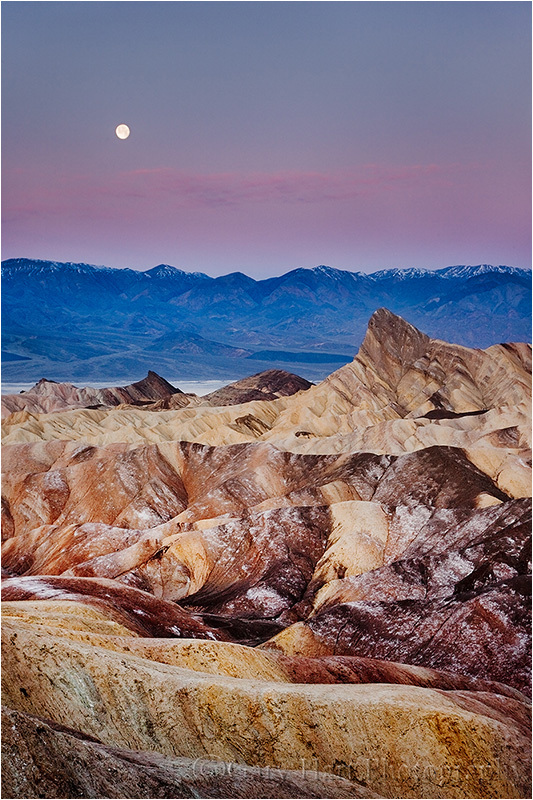 But using my iPhone’s GPS to pinpoint my location, Focalware gave me the sunrise and moonset information I needed to capture this full moon setting behind Manly Beacon (I won’t even touch the Freudian ramifications of that name) at Zabriskie Point. It’s also handy to be able to input the GPS coordinates of any location, which allows me to get the astronomical data I need for remote locations as well. Another app that works great regardless of connectivity is Depth of Field Calculator by Essence Computing. With it I’m able to quickly compute hyperfocal focus info for any camera or lens. I don’t need it all the time, but having this information instantly available when I’m trying to focus near and far objects in a single frame makes my life considerably easier. It’s also a fun app to play what-if games when I find myself waiting on hold or in line somewhere. I just plug in arbitrary values and try to guess the hyperfocal distance—a great exercise for improving hyperfocal focus skills. Dropbox is a bigger part of my home and mobile computing, but I do use my Dropbox app to access essential files when I’m on the road and away from a computer and the Cloud. While the Dropbox app requires connectivity to access files in the main Dropbox folder in the Cloud, I can specify files as “Favorites” to be kept downloaded and current on my iPhone at all times. My most important files are always flagged as favorites, and before leaving home I add other files I’m pretty sure I’ll need on that trip. The state of the tides makes a huge difference when photographing coastal scenes. Tide pools will materialize or vanish with the tide, and the look of the coast can change drastically when the tide swallows or reveals rocks. And some areas I’m accustomed to shooting may be completely inaccessible when the tide’s in. For all these reasons, before photographing on the coast I check the state of the tide with Ayetides. Ayetides stores its information on my iPhone, so I don’t need to worry about connectivity. On the other hand, I’m not crazy about Ayetides’ interface, which I find less than intuitive. Another app that I recently started using and have high hopes for is Trail Maps by National Geographic. In theory it’s exactly what I need—-an app that allows me to download specific topographic maps onto my iPhone for anytime, any connectivity access. It also allows me to plot point-to-point azimuth and distance for any location, great for computing moon and sun rise/set position. While I’ve been able to use it some, I’m afraid the current version of this app has far too many bugs, large and small, for me to recommend it. Since I don’t have vast experience with other similar apps, I can’t guarantee that the apps I mention here are the best. But I can say that they work great for me, and they make my photography life much easier. How about you? Do you have any apps on your iOS or Android phones that you find indispensable? Snapseed by Nik SW is good for retouching/processing. If you’re shooting near water, AyeTides has the tide data you’ll need for high and low. Thanks, Richard. Yeah, I have Aye Tides too, though I recently downloaded Tide Graph, which has a little better interface. On the other hand, Aye Tides might be better when I’m not connected–need to play with them more. I use Lapse It Pro to create time lapse with my Android device. It’s the most flexible one that I’ve found. “Star Chart” is great if you ever want to work the stars! Works with or without data service! It’s a must! Maprika, Gasbuddy and LunaSolCal are all great too! Thanks, Sam, I’ll definitely check it out. Gary, Planets has a great 3D sky feature to previsualize the Milky Way. Thanks, Chuck–I use Night Sky for this and love it. I have Planets too, but haven’t tried this feature.